For the first time in JAMA history, we’ll be bringing the lunch! This special lunch event will take the place of this month’s normal breakfast meeting. Lunch will be provided by our local sponsor, Firehouse Subs and is included in the price of admission. 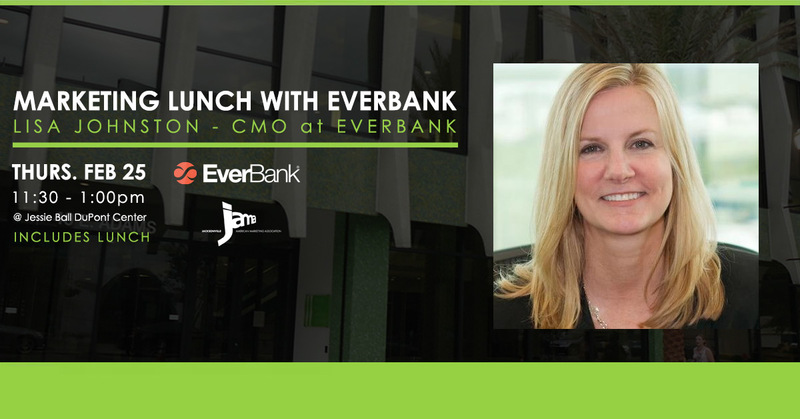 We are pleased to announce that February’s speaker will be the Chief Marketing Officer at EverBank, Lisa Johnston. Although EverBank is locally based in Jacksonville, they service customers across the country and compete with larger-scale national banks like Chase and Bank of America. Through strategic marketing such as a heavy online presence and obtaining the naming rights to the Jaguar’s stadium; EverBank has cemented its spot on the national stage. In this session learn how to become and remain competitive to companies that may be several times your size. Take away marketing knowledge that is relevant and can be applied in any industry, not just finance! Lisa Johnston is the Executive Vice President, Chief Marketing Officer at EverBank. Ms. Johnston has served as Executive Vice President, Chief Marketing Officer of EverBank since 2013, responsible for all marketing and corporate communication functions across EverBank. She joined EverBank in 2004 as Senior Vice President, Chief Marketing Officer. Prior to joining EverBank, Ms. Johnston was Vice President of Direct Marketing at American Century Investments from 1995 to 2004 and held various leadership roles within the banking and technology industries. Ms. Johnston received her Bachelor of Science degree from the University of Michigan and her Masters of Business Administration degree from the Yale School of Management.